Presumed Ocular Histoplasmosis Syndrome in the eye causes loss of central vision. The Presumed Ocular Histoplasmosis Syndrome is a major cause of visual impairment in the central and eastern United States, especially in the Ohio and Mississippi River valleys. Histoplasma Capsulatum is a soil fungus that is acquired through the respiratory tract. 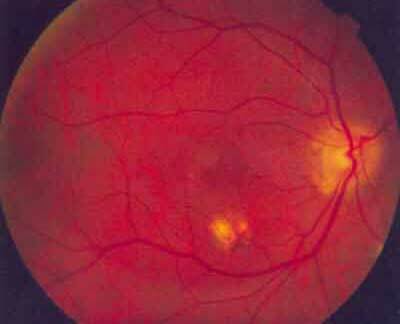 This syndrome can result in abnormal blood vessels that can bleed and lift the retina, causing a decrease in vision. However, there are several treatment options available today that were not available five years ago. These include traditional laser treatment, photodynamic therapy (also see below), and submacular surgery. Treatment options vary according to the severity, size, and location of abnormal blood vessels. Patients who have been diagnosed with presumed ocular histoplasmosis syndrome should check their vision every day to recognize any changes in their vision. The Amsler Grid is a useful tool for monitoring your vision. It is also important to see your retinal specialist on a regular basis to have a flourscein angiogram done to determine whether abnormal blood vessels are present. However, histoplasmosis, even mild cases, can later cause a serious eye disease called presumed ocular histoplasmosis syndrome (POHS), a leading cause of vision loss in Americans ages 20 to 40. The fungus causes small areas of inflammation and scarring of the retina. These are called “histo spots” and may be found in both eyes. The affect on vision depends on the location of the scars. Scarring in the peripheral area of the retina may have little or no impact on vision, while a central scar affecting the macula may cause a prominent blind spot. Although only a tiny fraction of the people infected with the histo fungus ever develops POHS, any person who has had histoplasmosis should be alert for any changes in vision similar to those described above. Studies have shown the POHS patients usually test positive for previous exposure to histoplasmosis. Most people with histo spots in the retina are totally unaware of their presence unless the central vision is affected. Studies indicate that only about 5% of those with histo spots are at risk of losing vision. A patient with an old laser scar [black circular area] and a new area of choroidal neovascularization [central white spot]. POHS causes ocular symptoms in two ways. 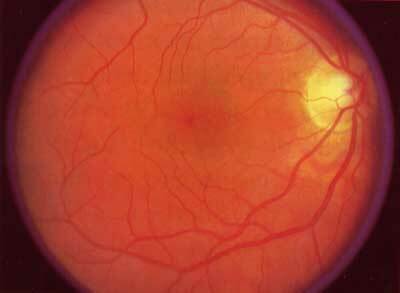 Small, self-limited areas of inflammation can occur leaving behind the typical atrophic “histo spot.” A more serious problem is when fragile, abnormal blood vessels grow underneath the retina. 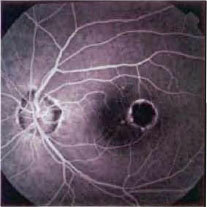 These abnormal blood vessels form a lesion known as choroidal neovascularization (CNV). If left untreated, the CNV lesion can turn into scar tissue and replace the normal retinal tissue in the macula. When this scar tissue forms, visual signals from the retina to the brain are affected, and vision loss results. 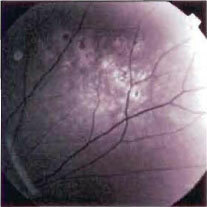 Vision is also impaired when these abnormal blood vessels leak fluid and blood into the macula. If these abnormal blood vessels involve the center of the macula, they may significantly affect visual acuity. Damage to the fovea can severely impair, and even destroy, central vision. Early treatment of POHS is essential because once the abnormal blood vessels affect the fovea, regaining central vision is more difficult. POHS rarely if ever affects peripheral vision, so the disease does not cause complete blindness. If fluid, blood, or abnormal blood vessels are present, we will perform a diagnostic procedure called flourscein angiography. In this procedure, a dye, injected into the patient’s arm, travels to the blood vessels of the retina. The dye allows a better view of the CNV, and photographs can document the location and extent to which it has spread. Particular attention is paid to how close the abnormal blood vessels are to the fovea. 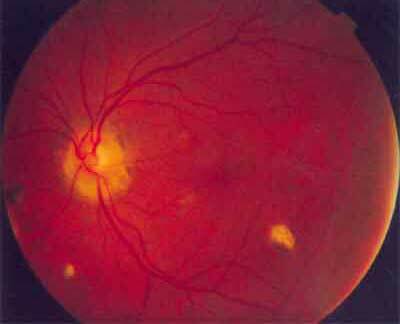 Ocular histoplasmosis requires no treatment except when abnormal blood vessels develop in the central retina. For these patients, laser treatment, intraocular injections, or vitrectomy surgery may be necessary. Regular eye exams and routine use of an Amsler Grid to monitor central vision is recommended for anyone with histo spots. The second form of laser is called photodynamic therapy (PDT or OPT). Initially developed for CNV due to macular degeneration, its indications have been expanded to include POHS. This treatment uses a light-sensitizing dye injected into a vein to more selectively destroy the vessels and spare the overlying retinal tissue. This is generally used for vessels that involve the direct center of the retina or fovea. The dye, called verteporfin (Visudyne), is infused into the patient’s arm over a ten minute period. Five minutes later a laser is used to treat the vessels for an 83 seconds. Because this photosensitizing dye is injected into a patient’s vein, the dye travels throughout their body and there are strict restrictions to avoid direct sunlight for five days. Like thermal laser, this treatment does not eliminate the original cause of the vessel growth, and patients generally need more than one treatment. Patients are seen on an every three month basis with repeat Fluorescein Angiograms. If there is leakage on the angiogram, the laser treatment is repeated. In rare cases where both eyes are affected by these vessels, a treatment can be performed sequentially with the same dye infusion. Right eye after photodynamic therapy. Triamcinolone acetate (Kenalog) is a long-acting anti-inflammatory steroid which is used in ocular histoplasmosis for its action against blood vessel growth and retinal swelling. It may be difficult to differentiate between inflammatory and early neovascular lesions, but kenalog has activity against both. Four milligrams are injected through the white part of the eye directly into the vitreous cavity. Topical and subconjunctival anesthesia make this a quick and painless procedure. The drug lasts in the eye for three months on average. Patients are followed monthly to monitor intraocular pressure which may rise after this injection. Bevacizumab is an anti-VEGF antibody that was originally approved by the FDA for treatment of colorectal cancer. Through pioneering work at the Bascom Palmer Eye Institute in Miami, Dr. Phil Rosenfeld and colleagues have shown this to be a very effective treatment for exudative macular degeneration. Based on a similar mechanism of choroidal neovascularization, patients with POHS have also been successfully treated with this medication. Because this is considered by most insurance carriers to be experimental, this involves out-of-pocket expenses for patients in Indiana. Despite significant advances in treatments, POHS still cannot be cured. Once contracted, POHS remains a threat to a person’s sight for their lifetime. People with POHS who experience one bout of abnormal blood vessel growth may have recurrent episodes. Each recurrence can damage vision and may require additional therapy. It is crucial to detect and treat POHS as early as possible before it causes significant visual impairment. A person with POHS can check for signs of damage to the macula by looking at a printed pattern called an Amsler Grid. If the macula has been damaged, the vertical and horizontal lines of the grid may appear curved, or a blank spot may seem to appear. We advise patients with POHS to check their vision daily with the Amsler Grid one eye at a time. If there are changes in the grid from baseline, call within 24 hours to set up an appointment.